On Monday, August 6, Mershid (19), son of Muhamad Abdalah Dawabsheh, checked for oncoming cars and started to cross the road between Nablus and Ramallah with his herd of goats. The time was approximately 5 p.m., and he was leading the herd towards the small village of Duma after a day of grazing. An Israeli car appeared as he was walking down the road but instead of slowing down it picked up speed and drove through the herd, killing 12 goats. 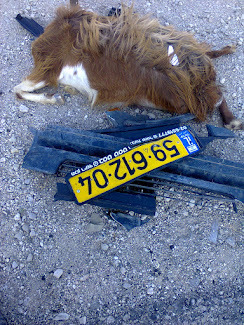 Driving through the herd, the front bumper including registration plate was ripped from the car. The Israeli settler stopped his car to retrieve his plate from the ground. As Mershid saw the armed settler he got scared and ran away. The whole incident was witnessed by Muhamad’s nephew, who was standing some 50 metres from the scene. As he started for the herd, the settler saw him, got in his car, and hit another three goats including the leader of the herd (the only male) as he drove off, leaving registration plate and bumper behind. In all, 15 goats were killed and 2 mortally injured, now hovering between life and death. As Muhamad arrived on the scene, he called the Israeli police. When no help was offered, he turned to the Palestinian Authority (PA) police. They asked him to come to the police station with pictures of the dead goats and car plate. He refused, arguing it is their job to go to the crime scene to gather evidence. In the meantime, the Israeli Military arrived at the scene about one and a half hour after the incident. According to Muhamad, the commanding officer seemed uninterested, asking only if it was his goats killed and if it was his son herding them. When demanding a copy of the report, Muhamad was told to keep quiet and stop asking questions. An officer from District Coordination Office (DCO) arrived with the purpose of notifying Muhamad that he could not help him. For reasons unknown to Muhamad, the DCO officer refused to help find the guilty settler. 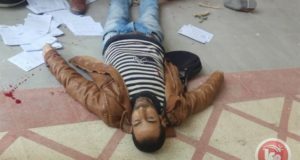 Muhamad was informed that he had to go to an office in the illegal settlement of Bet El if he wanted to pursue the case. This might seem like an easy venture, but Palestinians are forbidden access to the Israeli settlements built illegally on Palestinian-owned land. 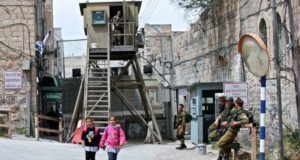 A PA officer arrived to the scene in a private car, but stopped in proper distance when he recognized the Israeli forces presence. He asked Muhamad to go and take pictures with a PA phone as evidence for the police report. Yet, with experience from similar incidents in mind, Muhamad seriously doubts the results of any such PA report. 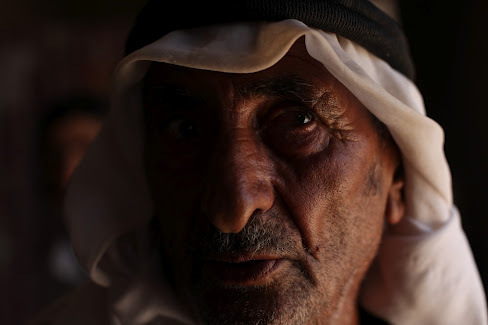 The family of Muhamad has been living and farming on the land of Duma for countless generations. One of their main products is goats’ milk and cheese. The goats are like family to Muhamad and he clarified to International Solidarity Movement volunteers that the loss is just as painful. His herd consists of some 100 goats. Males are sold and females are kept to produce dairy products and offspring. The death of the male means a huge economic loss for the family of 8. The goats have undergone selective breeding for many generations and are considered some of the finest. For Muhamad, it is impossible to put a price on the lost goats. They provide a living for the family and, for him, the mere question of pricing and money is an insult to the importance of the animals. Duma is a little farming village 21 km southeast of Nablus. Muhamad is head of one of two big families in the villages. Until the PA, subsequently to the Oslo-accords in 1994, appointed their own regional strong man, Muhamad was considered the unofficial head of the village. Duma is surrounded by 3 settlements: Shilo, Ma’ale Efrayim and Migdalim, and Muhamad believes the guilty settler is from one of these settlements. For the last 2 years, the villagers have experienced countless settler attacks. Not a single one has been solved, and Muhamad has little faith that the PA or DCO will act differently in this case. 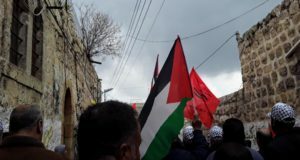 The village of Duma is considered Area B (Palestinian civil control, Israeli military control), but the enclosing Area C (full Israeli control) makes it a problematic task to farm on considerable parts of the land, belonging to the village. Yet Muhamad states that he will stay on his land and his sons will farm it when he is gone.